The French Third Republic was created following the defeat of France by Prussia in 1871. After the war, the leader of the new unified Germany, Otto von Bismarck, was able to take Alsace and Lorraine, Strasburg and the great fortress of Metz from France. The new French parliament established after the Franco-Prussian War, comprised an indirectly Senate and an elected Chamber of Deputies. In 1914 Raymond Poincare was President of France and Rene Viviani was his prime minister. In the first decade of the 20th century France was still an overwhelmingly agricultural country and was self-sufficient in food. France was one of the world's leading trading nations but industrial production was lower than both Germany and Britain. 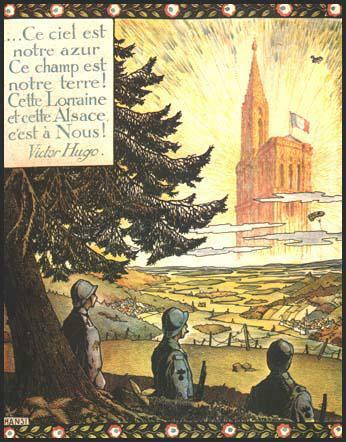 The French government considered Germany to be the main threat to its territory. This was reinforced by Germany's decision in 1882 to form the Triple Alliance. Under the terms of this military alliance, Germany, Austria-Hungary and Italy agreed to support each other if attacked by either France or Russia. Britain shared France's fears concerning the Triple Alliance and in 1904 the two countries signed the Entente Cordiale (friendly understanding). The objective of the alliance was to encourage co-operation against the perceived threat of Germany. Three years later, Russia, who also feared the growth in the German Army, joined Britain and France to form the Triple Entente. The French Army Air Service (Aéronautique Militaire) was formed in October 1910. France led the world in early aircraft design and by mid-1912 they had five squadrons (escadrilles). This had grown to 132 machines (21 escadrilles) by 1914. Expenditure on the French Navy doubled between 1910 and 1914. By the summer of 1914 France had 19 battleships, 32 cruisers, 86 destroyers, 34 submarines and 115 torpedo boats. The French government had ordered another 14 battleships but they were still waiting for them to be delivered. In January 1914 the French Army had 47 divisions (777,000 French and 46,000 colonial troops) in 21 regional corps, with attached cavalry and field-artillery units. Most these troops were deployed inside France with the bulk along the eastern frontier as part of Plan 17. With the fear of war with Germany a further 2.9 million men were mobilized during the summer of 1914.